That's a beautiful photo. 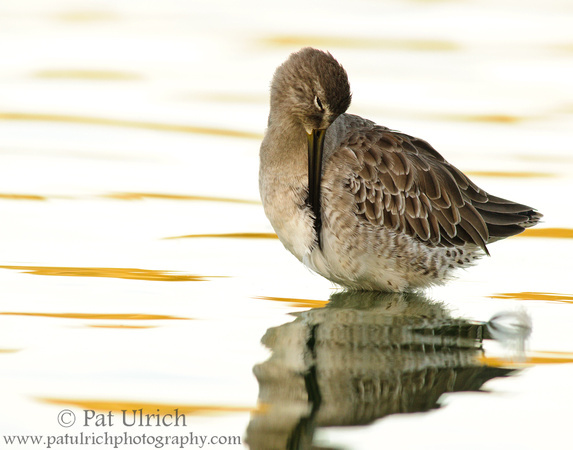 Dowitchers are very rare vagrants down here in Australia but the preening looks very similar to what the Godwits do. Marvelous shot, Pat! Your camera setting brought out all the fine feather detail of the bird. Love this, really beautiful...postcard...greeting card kind of perfect! Thats such a great picture - I can see I will have to try harder for some low angle shots. Gorgeous tones in this outstanding photo Pat. With the bird preening an added bonus! Spot-on exposure in a difficult situation. Very nice Pat.